Vance, a Trapper Boy, 15 years old. Has trapped for several years in a West Va. Coal mine. $.75 a day for 10 hours work. All he does is to open and shut this door: most of the time he sits here idle, waiting for the cars to come. 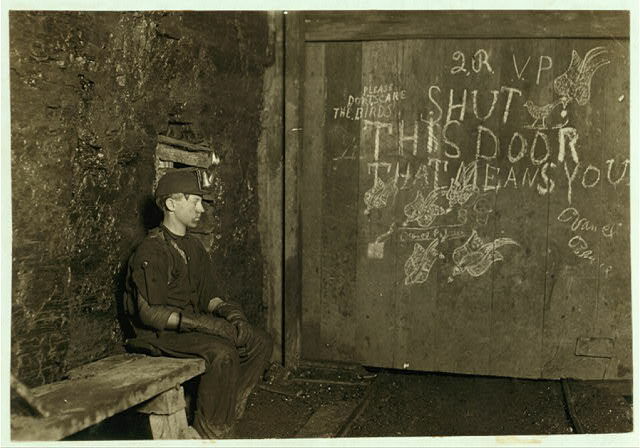 On account of the intense darkness in the mine, the hieroglyphics on the door were not visible until plate was developed. Location: West Virginia. Hine, Lewis Wickes,, 1874-1940,, photographer.